For adults craving cocktails with panache or a stunning craft beer, Great Falls offers a variety of settings to enjoy a signature cocktail. 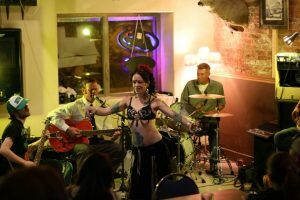 Whether you prefer you sip in an upscale wine bar, drink in a dive bar, marvel at mermaids, or enjoy the game with the crowd, Great Falls has it all! The legendary Sip n Dip has been named the #1 bar on earth worth flying for by GQ Magazine! The Sip n Dip is the only place where you can hear Piano Pat sing and watch mermaids and mermen swim! To truly experience the Sip n Dip, enjoy a fishbowl with friends. This tiki-themed drink combines UV Blue Vodka, Rum, Peach Schnapps, and fresh fruit in a 64 ounce glass; it’s not for the faint of heart! 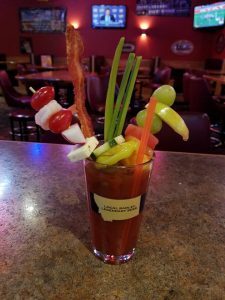 The Sip n Dip is an oasis in downtown Great Falls that has hosted many a bachelor/bachelorette party, birthdays, and other great events where people want to celebrate in a truly one-of-a-kind location. 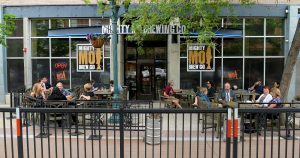 Mighty Mo Brewing Company was at the forefront of the revival of Downtown Great Falls. Great friends, great atmosphere, and great beer is not just a saying around here, it is the cornerstone of Mighty Mo. The Mo is a community gathering place where people can solve all the world’s problems over a beer or two, or at least try to! The Mighty Mo, in conjunction with the Great Falls BID recently unveiled the insanely popular Pedlet that allows diners to enjoy al fresca dining and drinking downtown! Every Wednesday, we enjoy pizza night with our friends. The atmosphere is fun, and enjoying a pint with friends is a great way to unwind. On Thursday, Friday, and Saturday night, live music is enjoyed by different musicians, and every-other Sunday, Mind Body Yoga partners with the Mo to bring you Brewing Balance, where you can enjoy a yoga session and after, a cold beer! Wines by Wednesday began by selling fun and unique wine, but has since expanded into a cafe, live music venue, and artisan grocer. Seasonal cocktails, special events, and an outdoor patio make this an upscale spot in downtown. 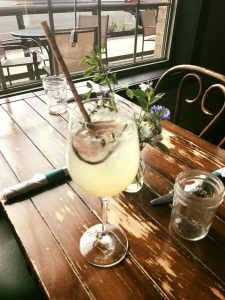 Wines by Wednesday is a fantastic place to enjoy a cocktail; my newest favorite is the Cranberry Wine Slushee Mimosa! Wines by Wednesday also has renovated an adjacent building into a premiere event center. 5th and Wine hosts live music, poetry readings, stage shows, and more in this intimate setting. For a great time in an upscale setting, you can’t go wrong with Wines by Wednesday! 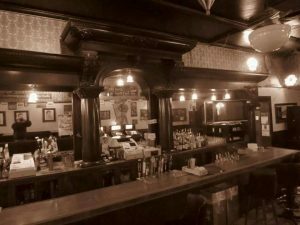 The Lobby Bar in downtown Great Falls has spirits – both fermented and ethereal – in one of the most haunted bars in Montana. The Lobby Bar has a storied past in what was once the Davenport Hotel built in 1914 by JG Anthony. Today, the Lobby Bar is a lively spot in the heart of downtown! Sharing a building with Maria’s Mexican restaurant, you can enjoy great food, have a drink, and enjoy live music. General Manager Tara Fatz, lovingly nicknamed ‘Terrible Tara’ has been the Manager of the Lobby Bar since 1987. Pull up a stool and ask for her signature cocktail and if you’re lucky, she’ll share a story from her own ghostly encounter! 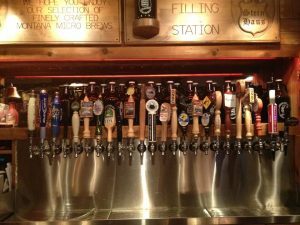 The Steinhaus has the largest selection of Montana Microbrews on tap. All 21 Made in Montana beers are proudly displayed, along with an ever-changing seasonal selection. The Juke Box has an eclectic mix of music new and old with quite a few hidden treasures. A pool table, dart board, and video gaming keep you entertained and the best firepit in town will keep you warm. The Steinhaus is a local favorite with a welcoming atmosphere. Saddle up to the bar and ask for some complimentary peanuts and be sure to toss the shells on the floor; seriously! Our very own Jake loves the peanuts at the Steinhaus and in his words, “It’s just what you do at the Steinhaus!” While at the Steinhaus, get adventurous and grab a pint of a Montana beer that you have not tried and order a custom pizza like Jake’s favorite, the Steinhaus Special, and don’t forget to look up at the hundreds of steins hanging from the ceiling to get the full eclectic nature of this legendary bar. 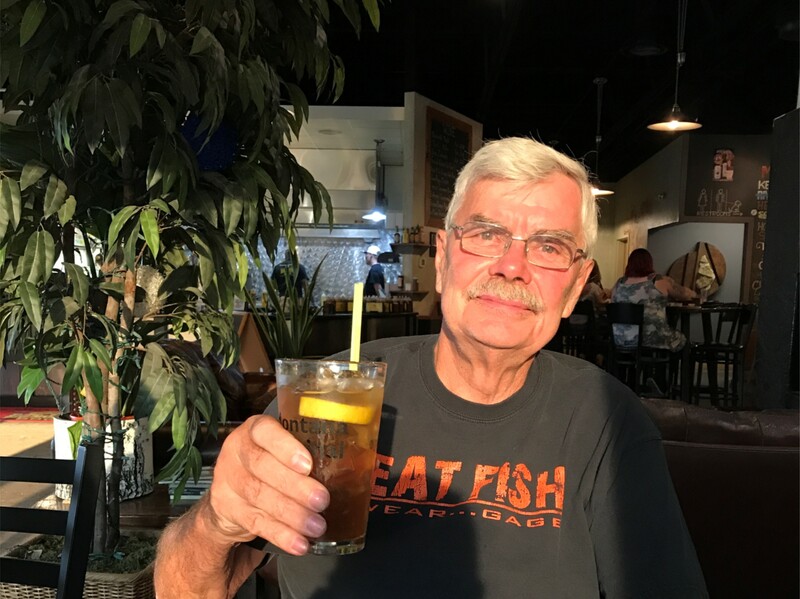 The Front Brewing Company shares a building with Big Mouth BBQ, so you can enjoy amazing BBQ; my husband’s favorite is the pulled pork sandwich. We recently treated my father to dinner on his birthday, and he fell in love with the rack of ribs and fried pickles. The Front, in addition to serving that amazing craft beer Great Falls is known for, has a fully-stocked bar; I’ve been known to enjoy a vodka cranberry from time-to-time! During the summer months, we ride our bikes to the Front along the River’s Edge Trail to enjoy the warm air on our way to dinner and reserve an outdoor table large enough to meet friends and enjoy catching up over dinner and drinks; the view of the Missouri River is breathtaking from the deck of the Front. During the winter months, the indoor fireplace warms us up along with the great service and friendly faces we always see! City Bar is one of the oldest family owned Bars in Great Falls! With the widest selection of gaming downtown and a fully stocked bar, City Bar is a place for everyone. What sets City Bar apart is their world-famous ‘Christmas in a Glass’ Tom & Jerry mix. 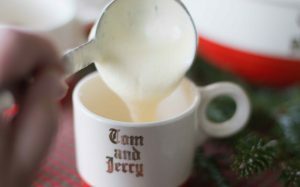 The seasonal favorite, a warm mix of hot water, rum, brandy, and nutmeg with a thick, creamy top has been a Great Falls holiday tradition for decades. City Bar goes through 15,000 eggs and 1 ton of sugar in a 6-week span to make the batter, and they ship the batter to fans around the country. More anticipated than the McRib, City Bar’s Tom & Jerry fanbase begin asking for this seasonal classic as early as September. The Celtic Cowboy is located on the Arvon Block in downtown Great Falls. In 1890, Welsh immigrant Robert Vaughn saw the need for an advanced livery stable. Thus became the Arvon Block, named for his daughter Arvonia. The building housed a livery stable, freight transfer office, vegetable market, and hotel. Vaughn, who by that time had received the nickname the ‘Celtic Cowboy’ went on to become one of Great Falls’ earliest philanthropists and leading citizens. Since 2013, the Celtic Cowboy Pub and Restaurant has built an award-winning pub, that evokes the lively times of the past in what is now one of the very few buildings left from the early days of Great Falls. If there is something to celebrate, you can celebrate it at the Celtic Cowboy! Pub Trivia Night brings trivia nerds (myself included) to the Celtic, while my husband prefers Whiskey Wednesday when he can enjoy 1/2 price Whiskey until closing. Live music always keeps the atmosphere lively, and the full bar will keep you coming back! The Back Alley Pub is Great Falls’ home for indie music from up-and-coming bands. Hipsters love this downtown intimate bar where they can enjoy Giant Jenga, Fooseball, a vintage jukebox, local art, and plenty of live music. My husband loves their Bloody Marys, and I enjoy their weekly Jeopardy! nights. Recent shows have included Go Hibiki, Beat Deaf, Ben McKee, Sissy Brown, Polly O’Keary & The Rhythm Method, and more artists representing rock, hip-hop, funk, soul, and trance. Check out a show at the Back Alley for the cred of seeing tomorrow’s chart toppers before they were discovered! The Do Bar is a fantastic place to see live bands, have a quick bite to eat, and enjoy good company over cold beverages. The eclectic crowd makes the Do bar a fun place to enjoy a cocktail without having to worry about what to wear. Show up, enjoy the music, and sip a cocktail. The service is phenomenal, the atmosphere is fun, and there is always something happening at the Do Bar! Every October, the Do Bar hosts a Caesar Showdown and even though bartenders are competing, you’re the winner since you get to sample the best Caesars in town! You can watch the game on any of their big screen TVs and even if your team loses, you’ll still have had a fantastic time! The Club Cigar was founded in 1914, and holds a wealth of Great Falls history and tradition. The centerpiece of this famous bar is the ornate mahogany backbar that towers 14′ high and runs 30′ in length. As beautiful as any in the state, this magnificent backbar was hand-made at the turn of the Century by the Brunswick, Balke, Collender Company. 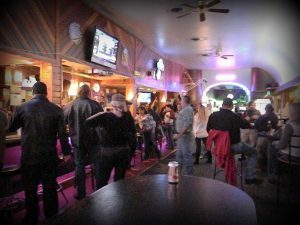 The Club remains a popular watering hole with a laid-back casual atmosphere, and is one of Montana’s best saloons! Every Tuesday, the Club Cigar hosts an open mic night. If you’re in the mood for Karaoke, the Club Cigar is the place to go on Wednesday nights. Friday and Saturday night, there is always live music to dance to. For the best combination of cocktails, art, and adventure, enjoy a seasonal Art Tour from the Downtown Great Falls Association. On these tours, you can enjoy a signature cocktail, appetizers, progressive dinner, dessert, and art. Best of all, you’re driven to each location on the Great Falls Trolley. I have enjoyed several art tours, and they are always different, always fun, and always a great way to experience Great Falls’ Urban Art scene. On a recent tour, we had dinner while watching belly dancers perform. It was an unexpected surprise, and I even convinced my husband to give belly dancing a try! Tickets for the Art Tours go fast, so stay connected to Great Falls events and follow us on Facebook to ensure you reserve your tickets before they sell out! 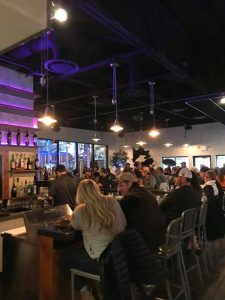 When you come to Great Falls to experience cocktails and craft beer, enjoy responsibly! Blacked Out 406 Taxi service can safely take you back to your room to ensure you can enjoy all that Great Falls offers again!